This Henry Greener piece is the second of the three jugs with manufacturer’s marks that I recently bought for a very small amount at a local antiques fair. 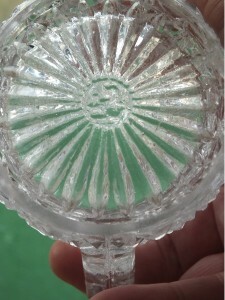 It’s a very nice shape and has a great first Greener mark on the inside and very clear. I’ve put this picture and two more, one of the mark, in the gallery. Well I have to alter this post as my latest buy, as I said, for the total of £1.99, turns out to be this nice little hobnail pattern Greener pressed glass jug. Not by George Davidson & Co of Gateshead, Newcastle-upon-Tyne but by Henry Greener of Sunderland. It’s a fantastic example of an imitation cut glass jug made for the use of “ordinary folk” who wanted something nicer on their table than earthenware pottery. They could aspire to the “higher classes” with utilitarian but beautiful glassware within the budget of large numbers of people for the first time in history. The mass production of the Industrial Revolution meant a man could make 150 jugs in a day rather than one glass piece over several days. This drove down the price of day to day objects and caused an explosion of ingenuity, design and production in glass manufacturing as in many other industries. This (now) Greener pressed glass jug weighs 426g, it’s heavy! It’s one of the identification factors for old pressed glass, it’s just much heavier than modern stuff. They hadn’t learnt how to use less glass material and cost cut yet. 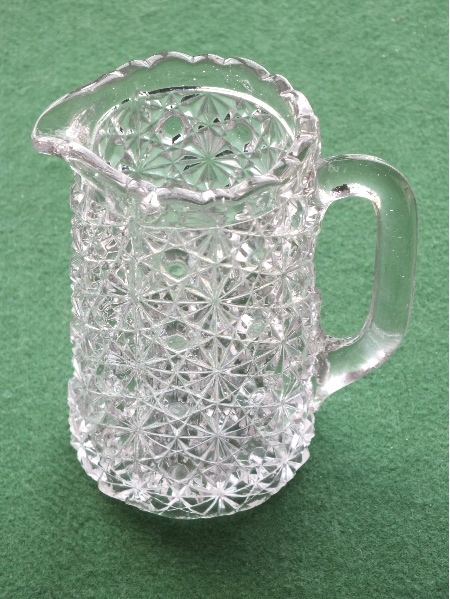 In the handle, and particularly the rim, there are loads of bubbles in the glass, I can’t see any in the body of the jug as the pattern makes it hard to see them. There appear to be no inclusions. The mould was not quite as tight as it could have been, you can see the flange of glass at the bottom of the handle, it’s really obvious when you feel the jug. The hot glass extruded through the loose part of the mould, leaving a flat and sharp surface protruding. 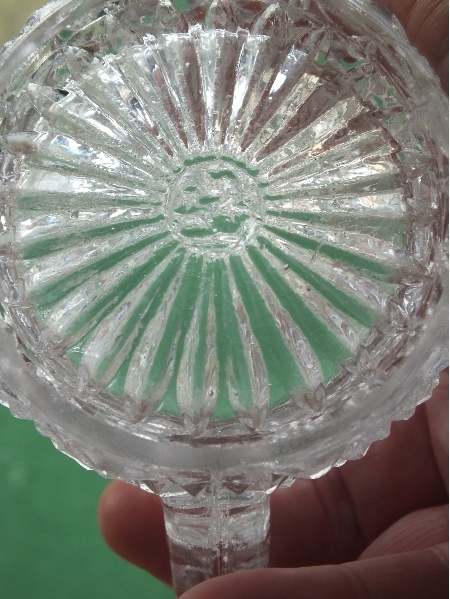 The maker’s mark is not especially clear on the bottom, but with a bit of juggling the piece around in the light I can see it’s the lion in a mural crown, the mark of George Davidson used between 1880 and 1890 approximately. Except that’s not what it is when looked at very very carefully. There’s a line joining the two paws of the lion, making it the second Greener mark used roughly between 1885 and 1900. I’m really pleased with it. This Greener pressed glass jug is a great example of a useful and good looking household item from a time when these pieces were becoming available to a large population for the first time. One of the really nice things about having a site dedicated to a particular subject is that people email me with comments and questions about their glass. Some questions are easy to answer, especially when the maker’s mark or registration marks are present. Others however are much more difficult, reminding me of the vast production of English glasshouses alone in the latter part of the Nineteenth Century, quite apart from the rest of the world. Most production was not marked in any way and many typically copied designs of other manufacturers. I’m always happy to help in any way I can, although I can’t value any pieces any further than looking at what current prices might be on Ebay. Good, in focus pictures which are close up enough to identify the details. Out-of-focus shots are not useful as it’s the small details of the patterns and marks which often makes the difference. Measurements of the sizes of the pressed glass objects, in inches or centimetres, as you please! I have a number of books but by no means enough to form a comprehensive library of pressed glass. So I’m always on the lookout for good reference books and for pattern books from the 1800s. There must be some hiding somewhere. I’m always excited when I’m waiting for a new piece of pressed glass in the post. I’ve been waiting for a few days now. These days I find most of what I buy on eBay. The post guy brings me the parcel this morning and I was keen to get the package open to see what my purchase was like. Well packaged that’s what. This is always good especially with antique glass. 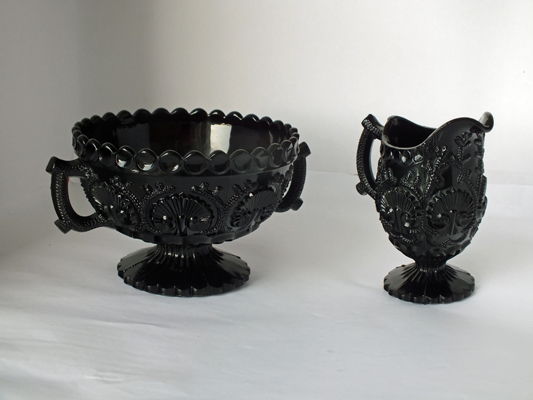 Then the two pieces of vintage glass themselves, dark black and shiny. They’re a bit smaller than I expected, I mustn’t have checked the dimensions. But I have no problems with that as they are both fine pieces. Many pressed glass pieces were useful but not visually interesting. Yet some were very attractive and some I think were a form of art. These are beautiful, sharp and with a marine inspired pattern. You can see from the pic they are a sugar bowl and cream jug in jet glass. The moulding of shells and coral are crisp and parts of the pieces are quite sharp. On careful inspection I can’t find any damage. So where were they made? There are no maker’s marks or registration marks or numbers but the pattern is close to another marked piece I have. That’s a blue and white vitroporcelain spill vase by Davidson of Gateshead in North-East England. It has the lion rising from a mural crown inside the base. And the design on the spill vase is almost identical to that of my new pieces. So I reckon it’s pretty safe to attribute this to the Davidson pressed glass factory as the design is so like a confirmed piece from those works. The date of manufacture is likely to be in the 1880s or 1890s. I’m pleased with my new acquisitions. They’re in perfect condition and great examples of Davidson pressed glass from North-East England in the later part of the 19th Century. Boot sales. Charity Shops. Bric-a-brac stores. These used to be great places to buy pressed glass. Surprises were relatively common and I built up my collection by going in to every one of these shops or sales whenever I came across one. Not any more. I rarely find anything of interest in these places now. The easy access to images and descriptions of any type of antique or book makes it simple for anyone to check on what they have. So people are more aware and my specialist knowledge of pressed glass is worth less in finding bargains. So how do I decide what to buy? Most of us have limited funds and/or time to devote to a hobby such as collecting antique glass so we have to be focussed. Click here to read the rest of my blog post about how to buy pressed glass. 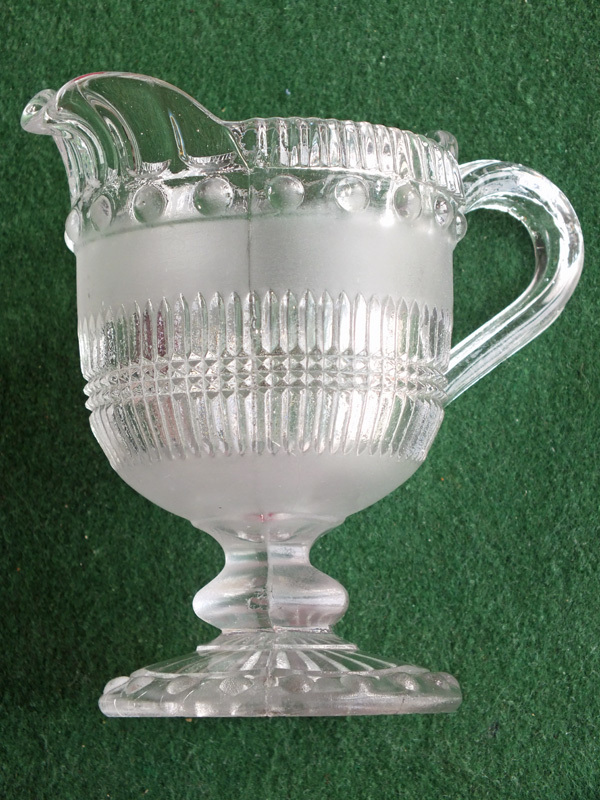 Here’s my 5 minute or less look at a pressed glass Davidson sugar and cream jug from the North-East of England in jet glass. 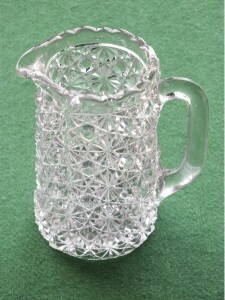 This pattern is number 126 in the Davidson catalogue of about 1885 so although it is unmarked we can attribute it to this glassworks. The pattern was a popular one and is found on a large number of articles from this time. It consists of patriotic symbols of the United Kingdom: the rose of England, the ostrich feathers of the Prince of Wales and the thistles of Scotland. Whether the Kingdom will stay United is not yet clear this 9th September 2014. The colour is a deep black jet glass, named after the gemstone found commonly in the North-East of England. The moulding is crisp, especially on the jug which feels sharp in places. This Davidson sugar and cream would have been affordable for many people in later Victorian times who would have been unable to afford any glass objects in the first half of the 19th Century. The coming of machine pressed glass allowed a man to make many hundreds of the same item every day which dramatically reduced the costs to the customers. Three major glasshouses dominated production in the north-east of England and the north-east dominated production in the whole of the UK. Products of all these glass manufacturers are avidly collected today – George Davidson, Henry Greener and John Sowerby. Pressed glass manufacturers produced a large range of ordinary items such as lamps for gas lights and light covers for trains. They also made normal day to day domestic objects and in some cases more artistic pieces. A very large number of people were able to buy useful and in some cases beautiful domestic wares such as this Davidson sugar and cream. I haven’t posted much for a while so I thought I’d take some videos of pieces in my collection as we rarely get a really good look at a piece when we see pictures of glass online. Of all the manufacturers I think I like Davidson pressed glass the best, there’s something about the designs and the colours which just resonates with me. This little pressed glass spill vase is one of my favourites. Its blue colour is so vivid and the design so well executed that the mould maker must have been very skilled indeed. I’m not aware of any old moulds which have survived but it would be very interesting to find one. I will be doing a series of “Tiny Glass Videos” which I reckon will be all under 10 mins at most and you’ll have to excuse my not very professional video abilities. However, I will improve. This is the first video and the transcript is available on YouTube or on my Davidson Pressed Glass Spill Vase page. I hope it’s of interest and please let me have any comments.